Written by: Karen on November 3, 2015. 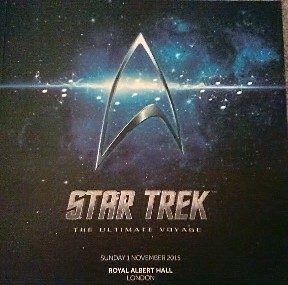 Star Trek boldly ventured to London’s Royal Albert Hall on 1st November 2015, for the second time in two years. 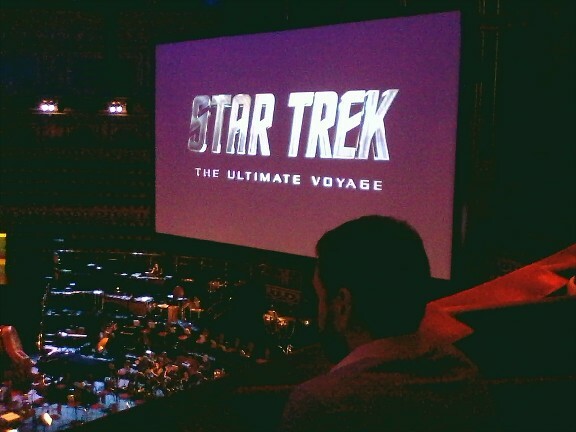 In 2014, we enjoyed the two recent Star Trek movies, accompanied live by the music of Michael Giacchino; this time, the Ultimate Voyage gave us a slice from every Trek incarnation, from the original series through to Into Darkness. Justin Freer conducted the Royal Philharmonic Orchestra in superb renditions of music by Jerry Goldsmith, James Horner, Denis McCarthy, and a host of other composers who have lent their talents to the Trek universe. The overture – the main title from Star Trek: The Motion Picture – was played without any video accompaniment, but then the video kicked in with ‘The Climb’ (set to ‘The Enterprise’ from Star Trek: The Motion Picture). The soaring music was the perfect accompaniment to clips, and occasional dialogue, which presented a visual theme of reaching up, of striving to do better. Footage from all the TV series held up well on the big screen, though it helped that the 40th Anniversary digital effects were used for the original series’ shots of the ‘Enterprise’. Many of the concert’s video montages had a specific ‘theme’ – ‘2 B Human’ set clips of Spock and Data against Jerry Goldsmith’s Ba’Ku theme from Star Trek: Insurrection; ‘Lifeforms’ took a look at some of the weird and wonderful aliens the crews met, to the accompaniment of Leonard Rosenman’s main title theme from Star Trek IV: The Voyage Home. There were spoken introductions to each piece too, which sounded as though they had been recorded by Michael Dorn – but, alas, the programme gives no indication of whose voice it was. Even if we could all guess, it does seem a little impolite not to acknowledge the contribution in an otherwise beautifully produced booklet. Back on the screen, we had speeches from Kirk, Picard, Sisko, Janeway and Archer, accompanied by a live rendering of the original soundtracks – stirring stuff. Best of all were the individual scenes, such as the fight from ‘Amok Time’ and the final showdown with ‘The Doomsday Machine’, splashed large on the stage-spanning screen, and accompanied by the iconic music (by Gerald Fried and Sol Kaplan) played at full blast by the orchestra. Watching those scenes on a TV will never be quite the same. The most poignant moment came in the penultimate piece, titled ‘Always Shall Be’, which was set to ‘To Live Forever’ from Star Trek Generations. Starting with Spock’s death scene from The Wrath of Khan it finished with three close-ups of Spock, all from different eras, all showing him holding up his hand in the Vulcan salute. I doubt there was a dry eye in the house. Check out America’s 2016 tour dates here.